Where do squirrels live? The answer may surprise you! When you take a peek outside your window or a stroll through the park, it isn’t surprising to catch a squirrel scurrying past you and scaling the trunk of a tree. You may wonder though, “Where do squirrels live?“, or even “What do squirrels eat? “. The bushy-tailed, frisky little critters actually come in a surprisingly wide variety of species and where they live depends on the species of squirrel as well as the region in which they live. In the following article, we’ll take a look at the most common type of squirrel as well as some you may not have even been aware existed, and discover where they choose to call home and why these particular habitats suit them and their needs. 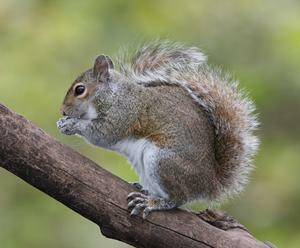 The animal that most likely comes to mind when you hear the world “squirrel” is a small, furry gray animal with round ears and a big, bushy tail. This is the most common type of squirrel, found in our schoolyards, dashing across lawns and dashing across parks with their mouths full of food. The most common type is the Eastern Gray Squirrel found throughout North America and some other regions. Where does the Eastern Gray Squirrel Live? The Eastern Gray Squirrel (Sciurus carolinensis) is a tree squirrel that is native to the eastern and Midwestern United States and can also be found in parts of eastern Canada. This is an adaptive species of squirrel that has been exposed to a variety of environments and thrives in both rural locations as well as the bustling cities of Manhattan and Boston. It has also been introduced to parts of Great Britain, Italy, Ireland, South Africa and Australia, though it has not been seen there since it was extirpated in 1973 (source). Given that the Eastern gray squirrel is a tree squirrel, it makes its habitat in the trunks of sturdy trees in dense wooded areas of its environment. The forests in which they dwell generally cover up to 100 acres of land and contain large amounts of heavy vegetation and underbrush that not only serve as an excellent food source but also provide shelter and disguise from predators. The Eastern gray squirrels tend to favor Oak-hickory forests instead of coniferous forests. The animals will construct their dens either high in the branches or within the hollow trunks of the threes. These dens will be found lined with moss plants, thistle, blades of dried grass and feathers. They’ve even been known to take over abandoned bird nests. A cover to the insulated den is usually built afterwards, preventing heat loss and keeping the squirrel and any baby squirrels it may have secure and protected from the elements and being easily identified by predators. One reason why trees are so favorable for Eastern gray squirrels is that in modernized rural atmospheres or urban environments, they can easily move from tree-to-tree and have much more access to food sources. Humans who leave out bird feeders will often be amazed at the squirrel’s ability to contort its body as it collects food. This is due to its ability to rotate its hind feet and descend trunks head-first as well as balance itself as it reaches out and grabs seeds. While the Eastern gray squirrel is the most recognized among Americans, it is only one of over 200 species of the family Sciuridae, which contains various small to medium sized rodents such as the prairie dog. The types of squirrels vary from tree squirrels like the Eastern gray to ground-dwellers such as the prairie dog. Where does the Indian Palm Squirrel Live? Another tree squirrel to note, however, is the Indian palm squirrel. They are the most popular type found throughout India’s regions and differ slightly from their American cousin. 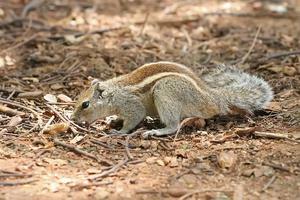 The Indian palm squirrel or three-striped palm squirrel (Funambulus palmarum) are found all over India as well as Sir Lanka. They were introduced to West Australia and have since become a minor pest due to its lack of natural predators (source). Resembling a chipmunk more than the Eastern gray squirrel, the Indian palm squirrel is slightly larger than a chipmunk but possesses a very similar gray-brown coat of fur that has three white stripes that run from head to tail. The stripes, often a dark gray and white, are found bilaterally from the head to the tail, and the tail itself is dense with thick black and gray hairs. More easily domesticated than Eastern gray squirrels, Indian palm squirrels are known to prefer urban areas. They can be easily tamed, and consist off a diet primarily of fruit and nuts. They are considered sacred in India and not to be harmed, mostly for their association with the Hindu diety Lord Rama, so it isn’t uncommon for people to be friendly toward them and offer them food. They still construct their nests in tree branches and hollow trunks, but unlike other types of squirrels, they do not hibernate during the winter. A tree-squirrel with a twist, the Southern flying squirrel has been featured in many different documentaries, perhaps even seen by you in a zoo, and although it is one of the two types of flying squirrel common to North America, an encounter with one is still considered a rare and exciting experience for most. The Southern flying squirrel, also known as the assapan (Glaucomys volans), is primarily found along the eastern half of the United States from southeastern Canada all the way to Florida. Populations have also been reported in Mexico, Guatemala and Honduras. The assapan is much smaller than your average neighborhood squirrel and looks much more like one of the wide-eyed, exotic pets you’d find in a large cage at a pet shop. They’re gray brown fur on top is matched with a creamy coat on their underbelly. What sets them apart from other squirrels is the furry membrane called a patagium that is attached between the front and hind legs and gives them the ability to “fly”. Preferring dense, high places, Southern flying squirrels make their home in the branches and trunks of towering trees in deciduous or mixed North American forests. Large hickory and beech trees seem to be their preference, but they also have a liking for maple and oak trees for habitats. While some of these little critters may be spotted in suburban areas, they aren’t generally found in towns or neighborhoods and prefer to keep themselves hidden in the forests. Therefore, you’ll never find a large population of Southern flying squirrels in a residential area and this is the reason why so many people are surprised to learn that they’re actually common to the U.S. and not Southern America. All animals have a home range, or area in which they live and travel. The size of a home range varies for Southern flying squirrels, though the average estimate is 2.45, 9.0 and 16.0 hectares for adult males and 1.95, 3.9 and 7.2 hectares for females. 0.61 hectares is reported to the the average span for juveniles, as they stay close to their dens where they can be cared for by their parents. Home ranges have been observed to overlap and increase in size among populations in areas where the tree density becomes more dispersed, as well as in fragmented forests where the location of potential nesting and foraging areas is more widely spaced. When they create a nest, Southern flying squirrels will locate the natural cavities and holes caused by woodpeckers in tree trunks and construct small nests made from twigs or leaves. While other squirrel species tend to return to their den often, the nest for these squirrels is used mostly in the summer where they are used for breeding and more intensely in the winter as temperatures plummet. The dens are small, with entrances that average about 4.7 centimeters in width by 9.4 centimeters in height, and are found at least 6.8 meters above ground. 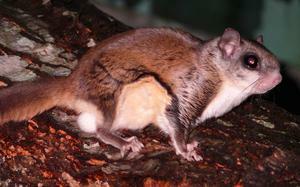 Highly social creatures, the Southern flying squirrels tend to travel and glide through the air in large groups. The proximity of trees in their habitat enables them to flock together and create close families and collect food without having to travel great distances or risk being exposed to natural predators. They also tend to stick to more mature forest corridors over younger ones, which scientists believe is a sign that they are much more sensitive to the elements and forest changes than previously assumed. 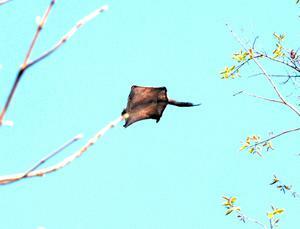 Perhaps you’ve seen a flying squirrel in your lifetime, or maybe even own one or know someone who has one as a pet. You’re surely encountered the Eastern gray squirrel and the Indian palm squirrel more or less seems like a slightly larger chipmunk. 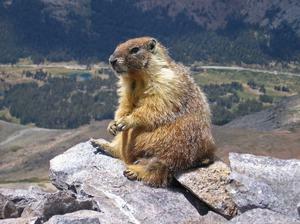 But what about the Alpine marmot? This whopping 6 to 7 pound creature is technically a squirrel, but looks much more like an overstuffed prairie dog. Found in the mountainous ranges of eastern Europe, the Alpine marmot (Marmota marmota) lives between heights of 800 and 3,200 meters in the Alps, Carpathians, Tatras, the Pyrenees and Northern Apennines of Italy. They are incredible diggers, known to penetrate soil that even a grown man with a pickaxe would have difficulty breaking through. It is through the tunnels that they construct that they are able to burrow themselves in and spend up to nine months each year in hibernation. 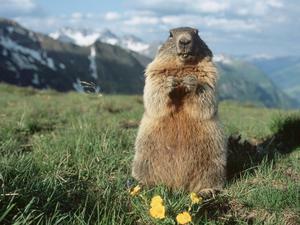 The Alpine marmot lives off a diet that consists of grasses and herbs as well as worms, spiders and other small insects. They prefer young, soft plants over any other kind and will sit and hold their food in their forepaws while eating. They tend to remain in their burrows for the majority of the time, but will emerge during the morning and early afternoons to feed. This could partially be attributed to the fact that they are not well suited to heat, so while their burrow keeps them cool, they are able to leave during the hours before the summer temperatures have hit their peak. On extremely warm days, they may not leave their burrow at all. This is why they will consume large amounts at one time, building up a thick layer of fat on their body, which allows them to hibernate for such extended periods without interruption. While the species of squirrel differ throughout the world, one thing is common. “Where do squirrels live?” is a question that can be answered by first looking at the type of squirrel itself and its behavioral patterns. They tend to choose areas that are most readily able to suit their behavioral tendencies and fulfill their needs easily, such as shelter, food and protection. Trees and forests are a favorite, but the little Eastern gray squirrels you see prancing around the yard are willing to wander away from the thick protection of the forest for the chance to gather some food. It’s important to note that forests aren’t just home to squirrels, but also thousands of other creatures and deforestation is rapidly growing threat in today’s world. We should all keep this in mind in order to ensure the longevity of these feisty little animals and take the necessary steps to be environmentally conscience of not just our habitats, but theirs as well.